While watching the Halloween episode of TV sitcom Young Sheldon (a spin-off of the uber-popular Big Bang Theory), I grabbed a pen and paper and took notes because it gift-wrapped an opportunity to tell you what a life of faith is all about. And why you might want to give that kind of life serious, thoughtful consideration. But then the script goes in this direction: “So what happens when people don’t follow the rules?” asks Sheldon. “They burn in hell,” answers his mother. First of all, the entire conversation smacks of “religion” and that’s a nasty term I want nothing to do with. As you can probably tell, religion is not about love. It’s about creating and enforcing rules in order to control and judge people. In other words, religion is exactly how Sheldon describes it. Secondly, this conversation portrays God as a vicious ogre who can’t wait to toss us all into Dante’s Inferno. I can tell you right now, if this was anywhere near the truth, I would not have become a Christian. But I am a Christian, which means I follow Jesus Christ, whom serious Christians believe is God’s Divine Son. I follow Jesus because He’s the living embodiment of God’s outrageous, break-open-the-champagne love for every person on this earth—no matter who they are or what they’ve done (or not done). He told us money and power aren’t where it’s at; a soul-restoring faith in God is the ultimate prize in this life and the life to come. Finally, Jesus is God’s solution to the problem of human sin. God’s standard is perfection and that’s how he sees everyone who follows His Son. God offers Jesus as a gift to YOU. Interested in accepting that gift? Yes or no, post your thoughts below and let’s have a conversation. I’m still trying to work up some fear. If you see logic with this graphic posted on an Internet atheism community, then apparently that’s the basis of my faith (not “religion” – that’s a nasty word). 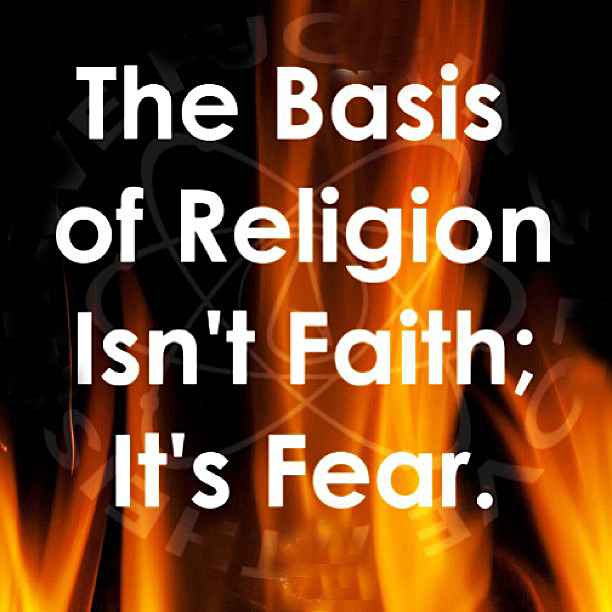 If I am to believe this graphic, then I came to a place of fear at age 42 – after reading many books from a variety of perspectives, debating several brave Christians and thinking long and hard about how this planet works. After all that, I decided to follow Jesus Christ — whom serious Christians believe is the Son of God — because I simply became more and more fearful. 1. Fear the possibility of disappointing Him. God knows my potential. He knows yours, too. In fact, He put that potential into you and me. So I fear not living up to that potential, of not truly letting Him into my life so He can make me all that I can be. 2. Fear mixing up who is in charge. I don’t know about you, but in North American culture, I need constant reminders that God is God. And I am NOT, no matter how many channels I can get on TV, no matter how many pills I can take to try and extend my life & health, no matter how often I’m told that I have control over everything. 3. Fear makes at least some sense when approaching the creator of space, time and the air you and I breathe. I heard one pastor liken it to approaching a massive, stunning waterfall like Niagara. We want to come close, but we also know that if we get too close, the water could drown us. And yet we still cautiously approach because it’s just so amazing, so glorious, so spectacular. We want to be in its presence. Does this make sense? Yes or no, post your thoughts and let’s have a conversation.